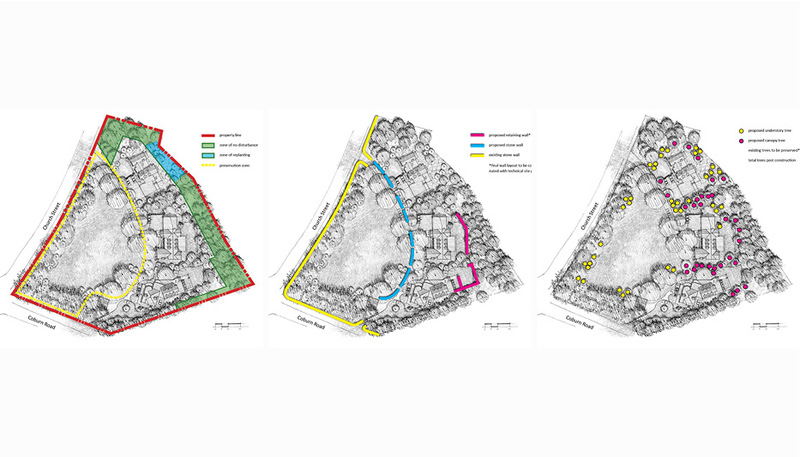 The project explores strategies to add two residential dwellings to a rural property in a manner that respects the agricultural character of an adjacent 'Historic District' and preserves the property's original mid-19th century home and iconic open field. To accomplish this, the new dwellings are nestled within existing trees and visually screened from the primary access road. Large specimen trees at the edge of the open field are preserved to maintain historic views of the property from the road. New low stone walls matching the character of the original perimeter wall as well as walls common to the district are also added. The project included preparing an illustrative report outlining the historic and cultural relevance of the property as well as the overview development approach and concept.